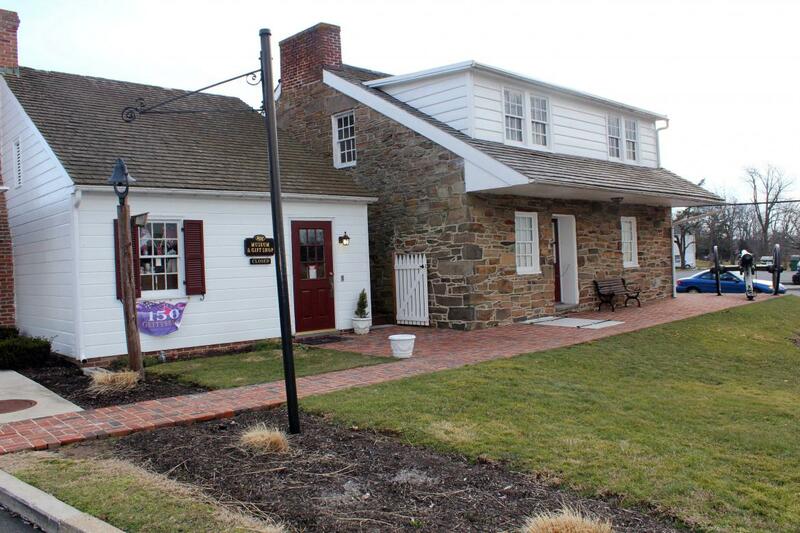 On October 28th, the Civil War Trust will cut the ribbon on the widow Mary Thompson house, also known as Lee’s Headquarters. We’ll show you some of the progress before the property is opened to the public. 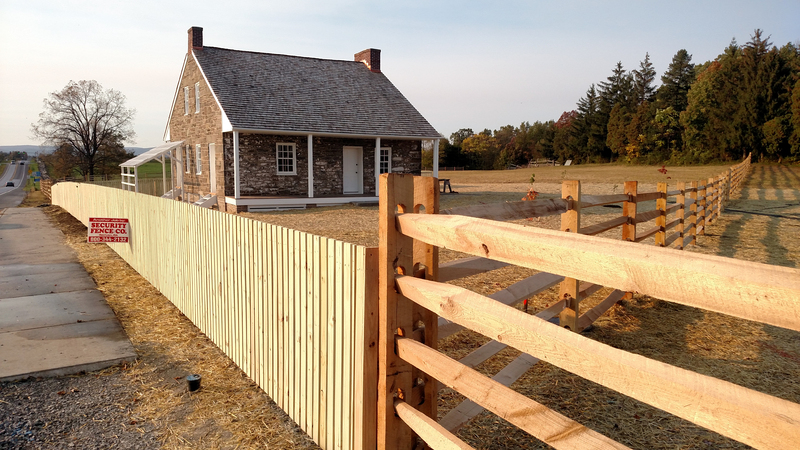 Our thanks goes out to the Civil War Trust for allowing us to highlight the restoration work that took place this summer. This image was taken facing southeast at approximately 5:00 PM on Tuesday, October 18, 2016. 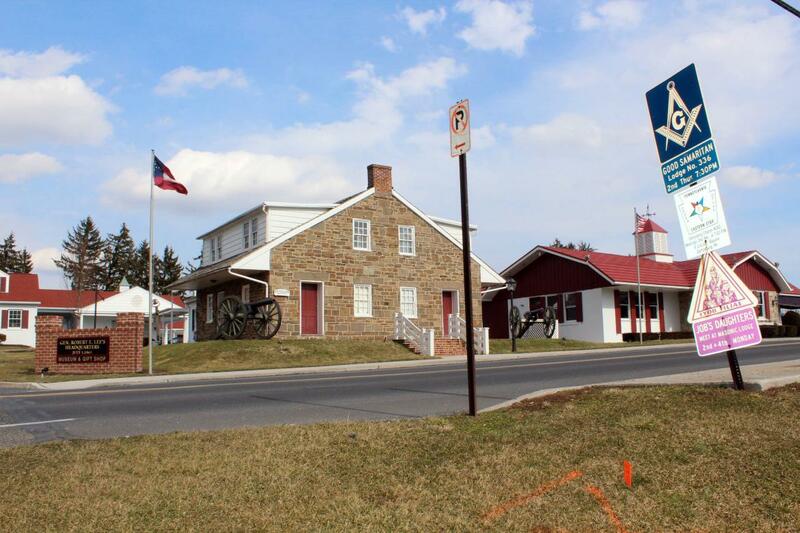 The property sits along the Chambersburg Pike (Route 30), northwest of the town of Gettysburg, along Seminary and Oak Ridge. Licensed Battlefield Guide Garry Adelman (right), with some help from Licensed Battlefield Guide Tim Smith (left), showed us around the property and explained the significance of the acquisition. 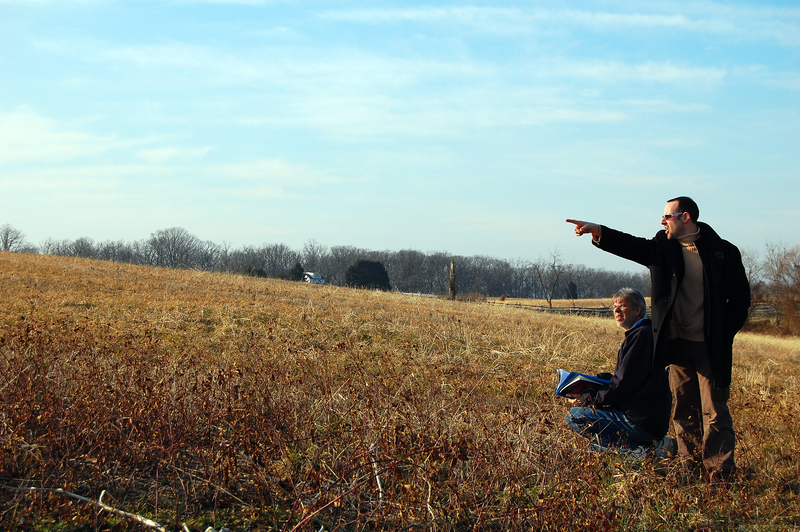 Here they are in 2012 discussing the Harvest of Death series at the Rose Farm. We’ll hear an update from Garry and Tim about the Harvest of Death photographs in an upcoming series.This image was taken on Wednesday, February 18, 2012. In our first video, LBG Garry Adelman shows us the acquired property from the foundation of the old Riggs House. The Riggs House foundation is next to the James Thompson House, along the southern side of the Chambersburg Pike.This video was taken facing at approximately 4:30 PM on Tuesday, September 6, 2016. 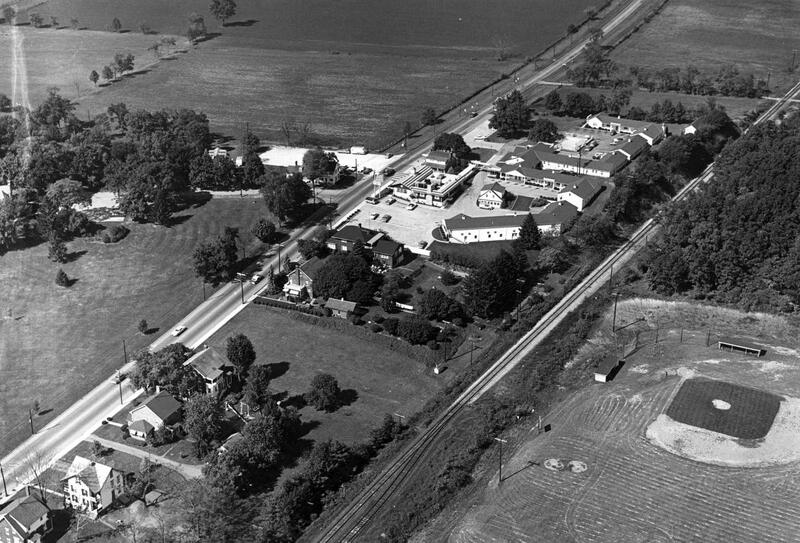 This aerial view of Seminary and Oak Ridge from the 1970s shows the Lee’s Headquarters property when it was still a restaurant/hotel complex. Hupp’s Battery Marker is located in the woods north of the baseball field, on Oak Ridge to the right of frame. This image was taken facing west circa the 1970s and is courtesty of the Adams County Historical Society. The hotel/restaurant complex as it looked a few years ago.This view was taken facing northwest circa 2013. Can’t forget the Museum and Gift Shop. 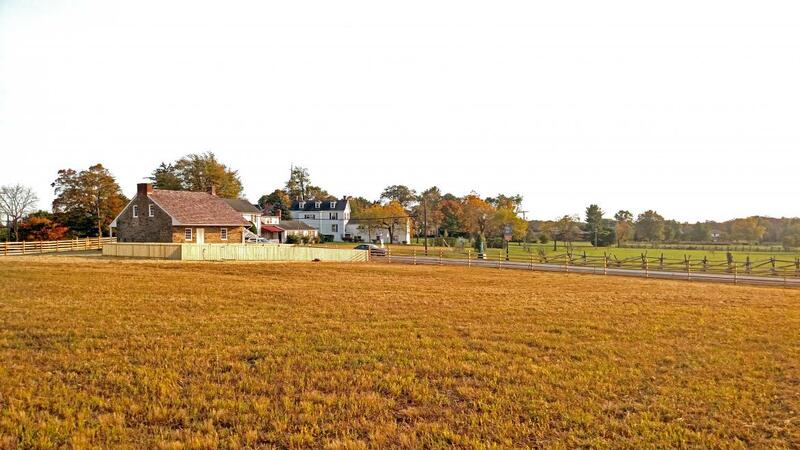 This view was taken facing southeast circa 2013. In our second video, LBG Garry Adelman explains the military importance of acquiring the property. This video was taken at approximately 4:30 PM on Tuesday, September 6, 2016. 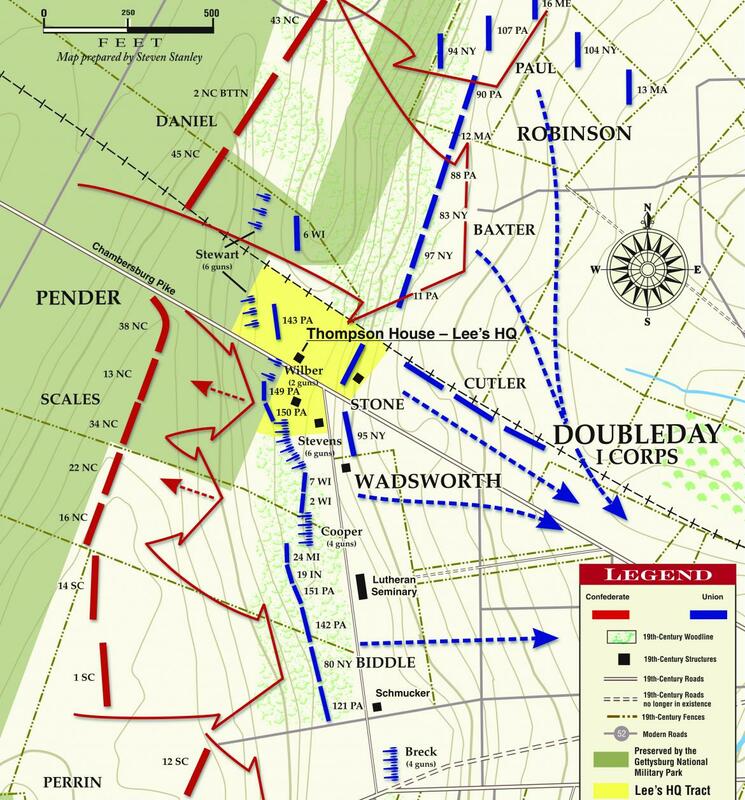 This Civil War Trust map shows the fighting on July 1st and highlights the area of Lee’s Headquarters.This map is courtesy of the Civil War Trust. 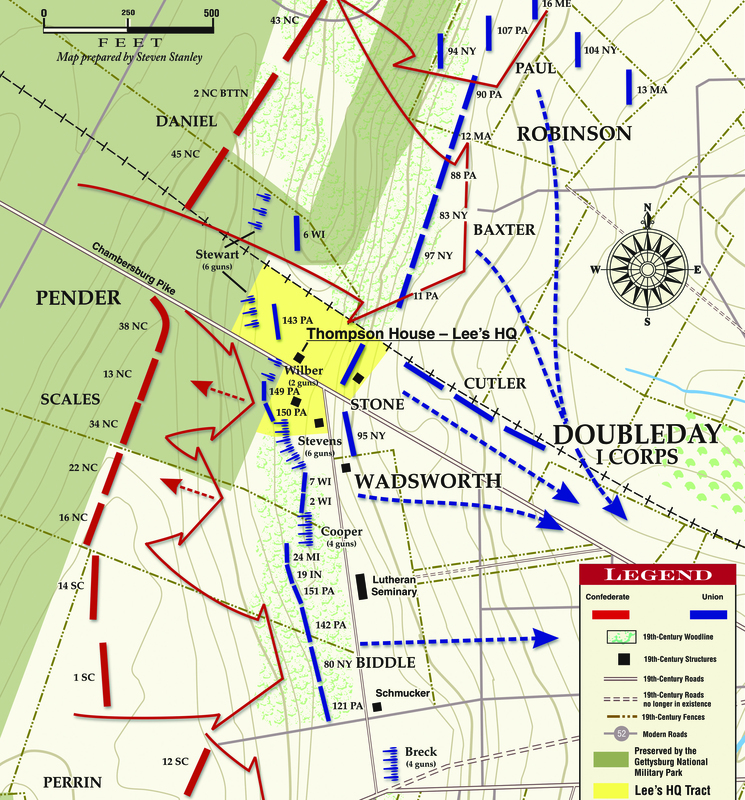 In our next post we’ll hear from LBG Tim Smith about the controversy over calling the Thompson House “Lee’s Headquarters.” This is an impressive project, and we’re excited to show you some of painstaking work that’s gone into its restoration. Here’s a view of the new fence, grass, and if you look closely, some of the trees that were recently planted.This view was taken facing northwest at approximately 5:00 PM on Tuesday, October 18, 2016.